Xanthi Barker’s One Thing and Mazin Saleem’s The Prick are the second and third of the Open Pen Novelette series, coming after Shitstorm by Fernando Sdrigotti. 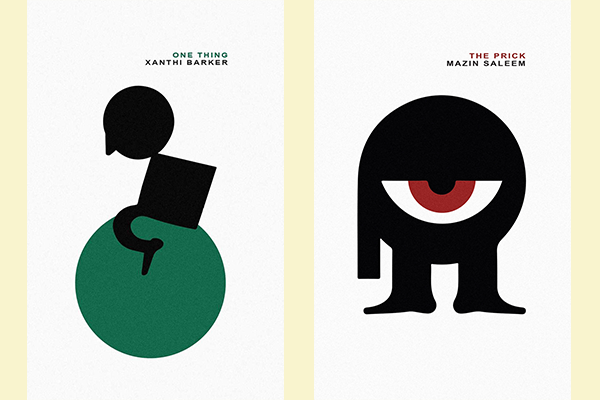 The books in the series are all wrapped in Pierre Butin’s stylish minimalist designs, but this is where such minimalism ends. From the first page both stories make for great reading, quickly unfolding into modern absurdist fables. What is this game of ‘shut doors’? It is one of the many figments of Len’s fractured imagination pulled to the surface and smoothed into the story. The padding isn’t bristly, but bristling — imbued with the energy Len can’t quite find himself. Barker uses form in an interesting way in One Thing, in that in allowing the prose style to fragment as it goes on, the sense of anxiety and dissociation in the grieving process grows and grows, feeling ever more real as the book progresses. 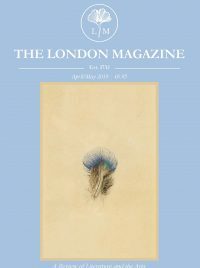 Len’s mind then links his ex-wife’s death with that of his father, said in such a way that it almost seems that Len is trying to validate his knowledge of the practical experience of grief: ‘funerals are regularly as short as forty-five minutes’, Barker tells us through Len’s thoughts, ‘his dad’s was a mean fifteen’. Given the brevity of the text, Barker expertly sways between present and past, real and imagined, without losing any cutting clarity. At one point Len imagines himself a pseudo-Heathcliff, the impulse to ‘tear her from the coffin, tear off her expensive dress and press his warm body against her’ almost overcoming him. Mazin Saleem’s The Prick contrastingly puts the strange and often unsettling friendship between Will and Roland at the centre, the structure based around ‘that day’ when Roland saved Will from being drowned in a riptide. Time passes, a week after ‘that day’, then ‘a month or so after that day’, ‘getting on to be several years after that day’ and so forth. This moves on exponentially with Saleem’s increasingly sarcastic chapter titles, implying that even he thinks his characters definitely should have moved on by now. With the defining action of the narrative happening at the beginning, the book could be seen to unfold as a sort of inverted crescendo, but to view the The Prick in such a structural way would be to miss the knotted social commentary that makes the book so interesting. For the longer that Roland — the eponymous prick — stays in Will’s life, we learn far more about Will and his friends. A year after the event, Will and his friends are at Roland’s house for a dinner party, and the guests take every moment to discuss their host, his high ceilings and they wonder at whether some white powder on the counter is icing sugar or class A drugs. One character justifies her inclusion of mushrooms in salsa because ‘the Mayan woman who taught me how to make it, she always did it like that’. Although the novel is about The Prick, the ultimate prick, Roland, we are not encouraged to like those who surround him, and that is the intrigue of the book. What Saleem delivers is so much more than just an exposure of one dysfunctional friendship, but is instead a darkly comical exploration into the young, modern, and middle class. Their relationships with Facebook, JustGiving, Tinder and other technological attributes of self-involved modern youthfulness seem just as authentic as with each other. In both texts we encounter often highly questionable characters in uncomfortable situations, dealing with some form of aftermath, and not knowing what to do. In both texts, this formulae makes for enthralling, compulsive reading, begging to be read in one sitting. Buy One Thing by Xanthi Barker here. Pre-order The Prick by Mazin Saleem here. For more information, visit Open Pen.